Those eyes. They were the faded blue of a clear winter sky, a luminous, translucent, glacier blue. They had invited me into a strange new world of isolation and loneliness, treacherous weather, icebergs and danger. And I had accepted. What had I done? I'd only met him in the pub an hour ago and I'd just agreed to go with him on his scientific expedition to a deserted island 600 miles from the North Pole. Just the two of us.' When Marie met a German professor in an arctic bar in Norway, her life took a turn for the extraordinary. She agreed to accompany him on a year long expedition to a remote, glaciated island with just two dogs for company. It would be like landing on the moon and living in a rabbit hutch. 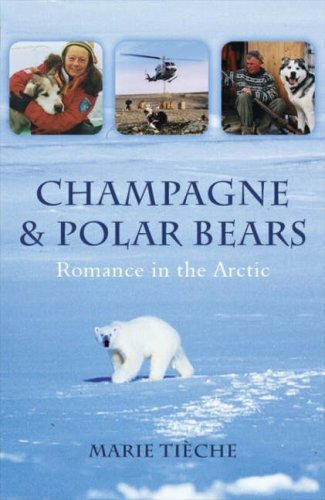 "Champagne and Polar Bears" is the true story of day-to-day survival in severe weather, adventures with inquisitive polar bears, and four months of total darkness. It also tells a story of one brave woman's personal development and a romance that developed in a small, frozen hut in the Arctic. It is a love story with a happy ending, to warm even the coldest heart. I picked up this book recently in a local charity shop. What a find! I thoroughly enjoyed reading about the year Marie and her German professor spent in the Arctic, living in the their little hut with regular visits from polar bears. I just couldn't put it down. It was so well written that I was immediately drawn into their life, their preparations for the trip and then all the happenings while they were in Kinnvika. It was interesting, exciting, funny and at times a little sad. For me it was made even more interesting as Marie comes from my part of the UK and the places she mentions are very near to where I live. I'm so pleased I found it as I don't think I would ever have found it in a book shop. I'm going to offer it as a bookring and I hope anyone who takes it up enjoys it as much as I did. You will be sending the book to the person who appears after you in the list, so you need to PM them to get their address. It's not a race, so just read it in your own time but remember that other people are waiting to read it too. If you're the last person on the list the book comes back to me. 23rd August - Have just noticed that I didn't actually comment after reading this book! This was a really interesting account of overwintering at 80 degrees north. I wouldn't have minded the book being twice as long though. I felt that coverage of the winter and spending that much time without the sun was very brief and I would love to have read more. Good book though and thanks for sending it out a ring. Arrived this morning - thank you :) Looking forward to reading this. Thanks for sending this out on a ring - unfortunately, I just couldn't get into it for some reason. I have PMd frangelle for an address and will get it moved on once I hear back. I couldn't get hold of Frangelle via PM so am sending on to Kerriou. Arrived safely this morning. Thank you, notingnothing. I've almost finished my current read so I hope to start reading this soon. An interesting and enjoyable read but I agree with MarianFrench that more could have been written about their lives during the months of darkness. I'd never heard of this book before and am glad to have had the opportunity to read it. Thank you for sharing, purplerosebud. Posted off to scotsbookie this morning. Arrived safely this morning, thank you kerriou & for the very apt & beautiful polar bear Christmas card. First of all apologies for having held on to this book so long! I really enjoyed this tale of life spent in the Artic for a year. I have calalilly's address & will have this on its way again asap. This was waiting for me when I returned to work after an extra long weekend. Thank you Scotsbookie, I hope you didn't think it had gone astray in the post. I've a few other books to read before I get to this, I hope you don't mind Purplerosebud.